Counter-clockwise from the top: Logo, original "fat" model, Sixaxis controller, DualShock 3 controller, current "slim" model. 550 MHz nVidia/Sony Computer Entertainment RSX "Reality Synthesizer"
iSCSI HD media over IPv6 from LIO storage on the PS3. 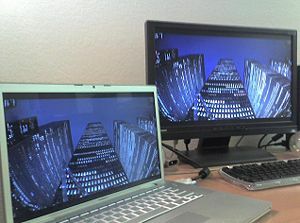 PS3 to MacBook Pro to DVI-Out from HD-DVD media. LIO up and running on the PS3. The Sony PlayStation 3 (officially abbreviated as PS3) is a seventh-generation game consoles that runs LIO. It is the third home video game console produced by Sony and the successor to the PlayStation 2 (PS2) as part of the PlayStation series. 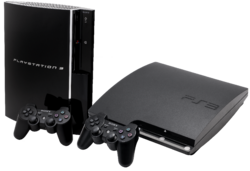 The PlayStation 3 competes with Microsoft's Xbox 360 and Nintendo's Wii as part of the seventh generation of video game consoles. A major feature that distinguishes the PS3 from its predecessors is its unified online gaming service, the PlayStation Network, which contrasts with Sony's former policy of relying on video game developers for online play. Other major features of the console include its robust multimedia capabilities, connectivity with the PlayStation Portable, and its use of the BluRay Disc as its primary storage medium. The PS3 was also the first BluRay 2.0-compliant BluRay player on the market. The PS3 is based on the IBM Cell Broadband Architecture CPU. The PlayStation (officially abbreviated PS) brand is a series of video game consoles created and developed by Sony Computer Entertainment. Spanning the fifth, sixth and seventh generations of video gaming, the brand was first introduced on December 3, 1994 in Japan. The brand consists of a total of three consoles, a media center, an online service, a line of controllers and a handheld as well as multiple magazines. LIO runs on both PS3 and the PS2. For the PS3, a Live USB image is available to turn the PS3 into a media jukebox. The PS3 runs LIO and iSCSI based on a modified Linux/ppc64 kernel. PPC modules (iscsi-target-module-2.6.25-2.9.0.295-1.powerpc.rpm) built for ppc64 and built with the toolkit for Fedora Core 8 ppc. Tested with Linux 2.6.25 from ps3-linux.git and built against arch/powerpc/configs/ps3_defconfig with drivers/md/* enabled as modules for MD/LVM access with LIO. The fastest and easiest option is to get the free live USB image from Datera, Inc., and follow the README provided with it. This setup was described in detail in the Linux Magazine. Second, configure and built Linux v2.6.29 from lio-core-2.6.git and under "Device Drivers" built the LIO core module, configFS infrastructure and the iSCSI target mode stack as loadable kernel modules (LKMs). The export of storage objects from the PS3 on Linux/ppc64 through the v3.0 code should be up and running now. Once configFS is mounted and the LIO modules can be loaded, the following set of configFS calls will grant r/w demo access to the ps3rom. iscsi_allocate_thread_sets:195: ***OPS*** Spawned 4 thread set(s) (8 total threads). Disabling iSCSI Authentication Methods for TPG: 1. Running the legacy LIO v2.9 iSCSI for PS3-Linux code is still supported, but requires manual setup see Target#Building-2.9. The following builds are a bit outdated, however, but might still be helpful. This module has been tested with 2.6.25 from ps3-linux.git and built against arch/powerpc/configs/ps3_defconfig with drivers/md/* enabled as modules for MD/LVM access with the LIO. Using the BD-ROM on a kernel older than 2.6.24 requires a small patch (ps3rom-use-128-max-sector.diff) for full performance. 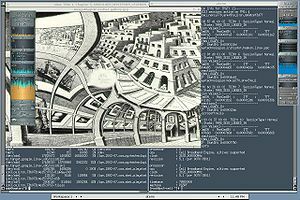 See ADDON CD for more information. LIO on the PS3 has been serving FILEIO and IBLOCK storage objects for OCFS2 and EXT3 Filesystem access on OS-2008 running on mobile clients (Nokia N800 and i386 Ubuntu). 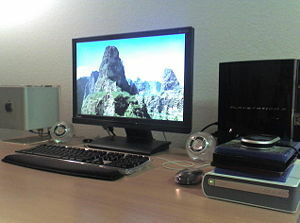 In summer 2007, the LinuxWorld PS3 BOF hosted a demonstration and discussion on running HD media types (BluRay and the now defunct DVD-HD) between a PS3, an Apple MacbookPro Laptop, and an USB connected Toshiba/MicrosoftHD-DVD drive. An 802.11n v1.0 IPv[4,6] wireless demo via a 1 GbE router connected to the PS3 running Linux 2.6.23-rc5 (the kernel sources are avilable from ps3-linux.git). ↑ Shilov, Anton (7/18/2006). "Asustek Computer Ships PlayStation 3 Consoles". X-bit Labs. ↑ "Entertainment on PS3 has a new look". Sony Computer Entertainment Europe. 8/18/2009. ↑ "PlayStation Direct.net". PlayStation Direct.net. ↑ "Sony confirms PS2 online plans". The Register. 8/15/2002. ↑ "PlayStation.com - PLAYSTATION®3 Features: Multimedia". Sony Computer Entertainment America. ↑ De Leon, Al (12/26/2007). "PlayStation Blog — PS3 Tips — Remote Play and PlayStation Store". Sony Computer Entertainment America. ↑ "PlayStation 3 Features - BluRay". Sony Computer Entertainment America. ↑ Lempel, Eric (3/20/2008). "Firmware version 2.20 bringing BD-Live to PS3". Sony Computer Entertainment America. ↑ a b Feilner, Markus (February, 2010). "Zum Spielen zu schade". Linux Magazine. This page was last modified on 29 September 2013, at 21:01.